The following article was written by world musician, composer, and American musicologist Greg Turner, who currently resides in south Korea where he teaches while researching and writing about various native world music forms. This article represents the first of an on-going series that he will share about world music and how it has a profound influence on entire cultures. It's a widely recognized phenomenon that certain combinations of sounds, tones, textures, and rhythms have a physiological as well as a psychological and meditative effect on our lives when exposed over any span of time. This article is intended to identify and establish a brief time-line of ethnic classical and folk music instruments that were created, invented, and adopted by the people of Siam, known today as Thailand. The E-Thai CD web site offers Thai classical and folk music that you can buy On Line to enrich your experience and enjoy the heritage and most relaxing forms of Thai folk music from the Kingdom of Siam. Over time, the people who were to later become "Thai," migrated from China or perhaps further east or north into what is now northern and central Thailand somewhere very roughly estimated between 2255 B.C. and 1254 A.D. Archeologists aren't certain where exactly they migrated from but some believe that they are from the area between the Hwang-ho and Yangtze rivers. Todays' Chinese music is derived from this region. In the 6th century, Khmers settled in what is now Northern Thailand. The Khmers eventually held rulership over north and central Siam, forcing the people further south to endure the invaders rulership. In the 13th century the Thai people of Siam rose up and overthrew the Khmer. The Thais had instruments of their own and some were from China such as the khim dulcimer, malaw cymbal and klawng jin drum. The music of India had penetrated into the Mon (southern Burma) and Khmer (Cambodia) cultures previously. Later, the Thais also came in contact with Indian music. They successfully copied many of the Indian instruments. The Thai's also created their own instruments from this interaction, namely the phin, sang, pichanai, krachappi, chakhe and thon. These are mentioned in one of the oldest books to come out of Thailand called the Tribhunikuthai and also on a stone inscription called the sila-ja rerk created during the reign of king Ramkhamhaeng who was considered the father of the nation during the Sukhothai period 1283 A.D. (Sukhothai translates as Dawn of Happiness since they overthrew the Khmer rulers). At this time they adopted some instruments such as the glawng khaek from java, the klawng malayu from Malaysia, the perng mang from the Mon people and the glawng yao from Burma. Actually, India and Persia were already having an influence on music in China by 126 B.C. China had a book on Indian music within 5 years prior to 642. Indian music also was having an impact in Java at least by the thirteenth century, so any instruments or music borrowed from there at that time may also have been affected by India. Not much is known about Malaysian history prior to the 15th century since little was recorded except that Hinduism was having a strong presence there obviously coming from India. China records contact with Malaysia at this time and up until 1824 it was predominantly under Thai control. The Thai tuning system is originally derived from the Javanese which in turn was derived from Chinese music theory. The Thai system is based on seven pitches an equal distance apart from each other. This results in a scale which not only does not have a perfect fifth but also has no notes which will be the same as any in the western scales. In Thai music, the fourth and seventh pitches are usually avoided, a practice similar to the avoidance of the 3rd and 7th in China. They function as ornaments or passing tones. Thai music is in duple meter and progresses from slow, to medium to fast, similar to Indian and Korean music. Accents fall on the last beat in a group of four, the same as Korean and gamelan music of Java and Bali. The accents are played by open and closed cymbal patterns. These can be further subdivided. This relates to the rhythmic structure of gamelan music but which is played by gongs instead. Thai music has no chords per se. The core melody is played simultaneously with its variations. They only play in unison or octaves at important points in the form then go back to playing different variations. The Seung is a plucked lute. It has a round body, metal strings and is played with a pick made of horn. The Tsalor is a spike fiddle. Its body is a coconut shell with a thin soundboard. The northern Pi is a six-holed, bamboo oboe with a metal reed. It has three sizes. The Klong Pong is a double sided drum. The Klong Tueng or Klong Awe is a long drum, about 3 1/2 meters, with a single head played at the temple and in ensembles. It is played with a wooden stick. The Saw Samsai is also a spike fiddle made from a coconut shell with an animal skin soundboard. It is only played in the Mahori ensemble. It has been in use since the Sukhothai period (c. 1350). King Rama II was fond of it. The Saw U has two strings, a coconut body and an animal skin soundboard. Similar to the Chinese Hu-hu but without frets. The Saw Duang is another fiddle but it has a small tubular hardwood body and a snake skin soundboard. It can use 2 silk, gut or metal strings. It is the leader of the string ensemble. 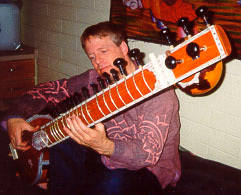 The Jakae is a plucked instrument. Its first two strings are made of silk and the last is made of brass. It is played while the instrument is layed horizonatally on the ground like the Japanese Koto but has a banjo like body and high frets like the Korean Komungo. The right hand plucks with an ivory pick. The Khlui is a bamboo recorder with seven holes covering one and a half octaves. It comes in several sizes and is used in the Mahori and string ensembles. The central Pi is one of the oldest Thai instruments. It is an oboe usually made of hardwood with six holes. It is an instrument capable of a wide range of _expression. The Ranad Ek is a xylophone whose 21-22 bars are strung together and "hang" down making a curve which gives the instrument the appearance of a barge. The bars are either made of bamboo or hardwood. It is the leader of the ensemble. It is higher in pitch than the Ranad Thume. The Ranad Thume is a xylophone with 18 bars. It accompanies the Ranad Ek. The Gong Wong Yai plays the main melody. It contains 16 gongs similar to those used in gamelan ensembles except arranged in a circle. It is played with mallets. The Thon is a drum whose body is made of wood or clay it is originally from Arabia though the Thais acquired it by way of China. The Rammana is a thin/short frame drum played together with the Thon also originally from Arabia. The Glong Khaek is a drum that plays in the Mahori, Piphat and Krung Sai ensembles. It is played with two hands. It is originally from Java. The Glong Song Na is a drum always associated with the Phiphat ensemble. The Thap is a drum similar in shape to the Persian Dumbek. It signals changes in rhythm and is used in a supporting role for the souther Nora dance. There is usually a low and a hi drum played together. The Klong Nora is a barrel shaped drum used for the Nora dance. It is played with hardwood beaters. The Mong has two gongs mounted in a wooden frame. It provides the fundamental note/drone for narrative singing. The Ching is a small, round hand cymbal used with narrative singing. The Trae Puang is a percussion instrument used in the nora ensemble made of 10 pieces of hardwood arranged perpendicular to the floor. By plunging a handle, the bars are made to resonate in rapid succession. The Kim is a hammered dulcimer with three strings per course similar to the Chinese Yang Chin. Both are originally from Arabia. The Khaen is one of the oldest woodwind instruments in the world. Its body is made from cane. Its reed developed directly from discoveries about metal made in the bronze age and functions like a harmonica. It comes in different sizes, has finger holes and can play simultaneous pitches. The Wode is a pan flute that comes in a linear and circular form. The Pong Lang is a xylophone played with hard sticks consisting of 15 wooden bars strung together. The lower pitched end is elevated and mounted on a post so that the xylophone bars hang on a diagonal. It is played by two people. One person plays the melody, the other plays the drone. It is also used in the Phleng Phu Thai San Phao ensemble. The Jakae is a plucked zither and plays in the Mahori Khamen ensemble. It probably descended from the Indian Vina. It is played while it rests flat on the ground like the Japanese Koto but has frets like the Korean Komungo. The left hand frets while the right hand plucks. The Krachappi is a Thailandized word taken from Japan which was originally taken from Indian Pali/Sanskrit which means turtle. It is a plucked lute. The body is a large circle like a big banjo. It is made of wood and has frets. with a body made of wood and a snakeskin soundboard. It has two metal strings. A loop is attached between the bridge and the nut to take up the slack on the string. It comes in three sizes.